More breathtaking than fireworks, lightning exploded in the night sky. For miles around there was nothing but fields and lightning. Black filled with light; blazing paths and brilliant flashes of light sliced across rolling clouds. It wasn’t raining. But we were surrounded by God’s own melodic composition. I’d never seen anything quite like it. We drove in silence, mesmerized. Perfectly timed, a song began. An invisible drummer synced lightning and song. Percussion, strings, rhythm, tempo- all aligned in radical harmony with God’s creation. And the heavens burst with the glory of God! My struggling heart soaked it in, overwhelmed with God in His spectacular beauty. The God who corrals lightning for His personal symphony is great. Stars sing to Him. The galaxies shout His name, and creation kneels. This God is doing much more than I understand. 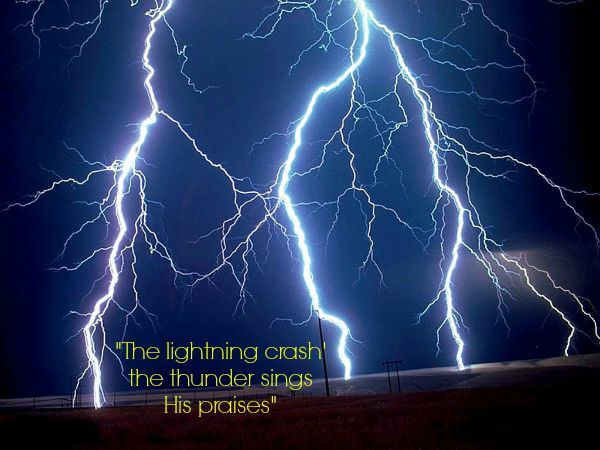 How great the power of harnessed lightning, but greater still is the power of the Gospel! If lightning is mighty, how much more power raised Christ from the dead? “For I am not ashamed of the Gospel for it is the power of God for salvation to everyone who believes…” Romans 1:16 Uncertainty gave way to worship. “Oh how great You are!” I praise you. My life is an offering. And I knew I could praise Him in the wait. I could praise Him even if there were never dark headed, blue-eyed babies. I get to be an instrument, but the symphony is not for me. It’s about His glory, His fame, His renown. And He deserves it. But here we are. Three years later faith has not yet turned to sight. No blue-eyed babies fill the house with laughter. Further still, no husband drives through country roads. But tonight the sky exploded again with radiant, syncopated lights crashing as symbols. I watched with calm heart soaking it in. And I remember. I worship the God who comes like lightning. I praise Him in the long wait. I don’t write the song. It’s not my symphony. Mine would have no rhythm: the mindless banging of a toddler. But He conducts a infinite orchestra, each instrument intricately woven in complex, ravishingly beautiful composition. He’s the conductor, the musician, and the composer. It’s His masterpiece. And it is the most beautiful thing I’ve ever heard. The lightning! (For some reason I couldn’t load the video here. So check it out at aNew Season) “How Great You Are” © 2012 Sovereign Grace Worship (ASCAP) inspired by “How Great Thou Art” by Stuart Hine (1949), music and words by Joel Sczebel and Pat Sczebel. < Previous Sometimes I still have nightmares. Next > The dream must shatter: Revisiting 2008. Ahhhmen Ami. Thanks for sharing your heart. Vicks! (Or John maybe?) Thank you. I’m glad it was encouraging for you. Love you guys!